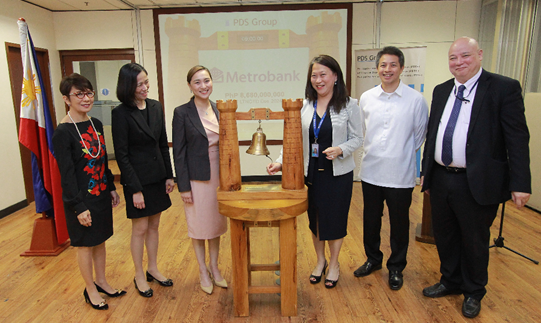 04 October 2018, Makati Philippines – Metropolitan Bank & Trust Company (Metrobank), the first bank to list its issues in the PDEx secondary market, returned for the fifth time to herald the start of trading of its PhP 8.68 Billion Long-Term Negotiable Certificate of Time Deposit (LTNCTD) due 2023. With Metrobank’s listing, the Ty group of companies’ cumulative level of outstanding securities listed on PDEx stands at PhP 68.79 Billion, representing 7% of the total corporate fixed-income issues in the organized secondary market. This 17th listing for the year marks the 135th listing since the since the market was opened to the public investors in 2008, which brings the year-to-date total of new listings to about PhP 133.18 billion and the total level of tradable corporate debt instruments to PhP 925.06 billion, reflecting a 23% increase from the same period last year.